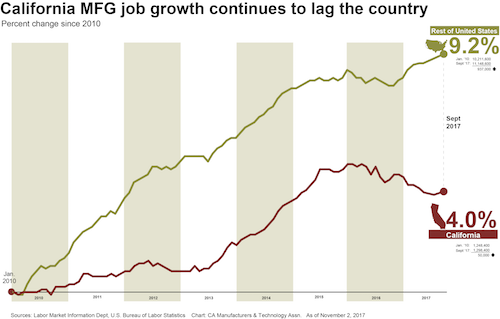 Californa gained about 1,400 new manufacturing jobs in December 2018 according to numbers released by the Labor Market Information Department on Friday. California saw some good gains in 2018 but we are still getting outpaced by the country by a substantial margin. As you see below, our clip of manufacturing job growth is 5.6 percent versus the country's 13.2 percent. Further, our largest industrial county has declined by 7.3 percent in manufacturing job growth. California lost 1,500 manufacturing jobs in September according to the Labor Market Information Department's report last week. At the same time, the U.S. grew its manufacturing base by 18,000 jobs. 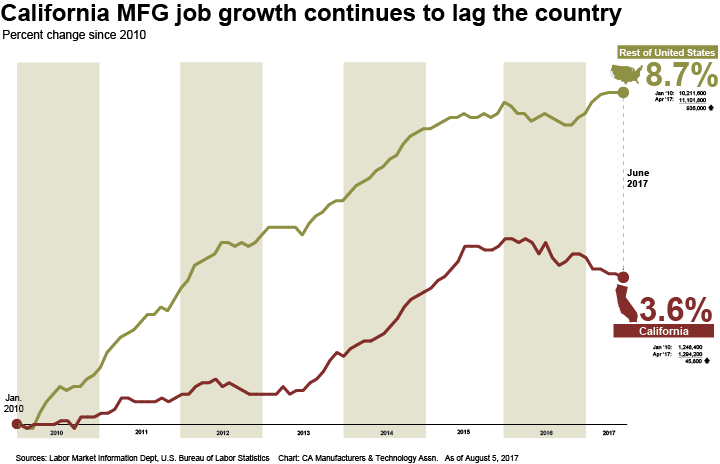 That brings the Golden State's percentage growth since the end of the recession to 4.6 percent while U.S. manufacturing jobs grew by 12 percent. That's more than 31,000 good job opportunities in the next 6 years with an average $42.3k salary. And that's just the manufacturing occupations with more than 2,000 openings. There are hundreds of other occupations with higher wages. It's important for our young workers to understand the opportunity that's available to them and even more critical for our policymakers to understand how important it is to grow manufacturing opportunity here in California. 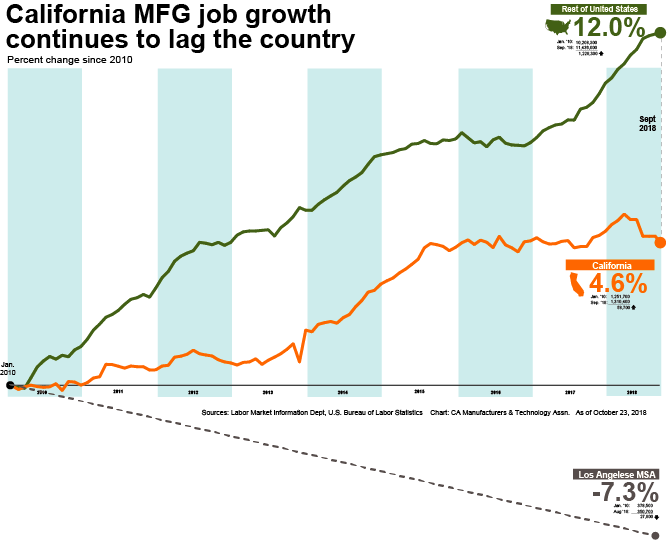 California continues to lag the country's manufacturing growth. While California grew its manufacturing jobs by 3.6 percent, the rest of the country picked up 8.6 percent since the end of the recession. Some big winner states include Kentucky at 20.5 percent, Indiana at 19.9 percent, South Carolina and Tennessee both at 16.5 percent, Colorado at 15.4 percent, and Ohio at 12.0 percent. 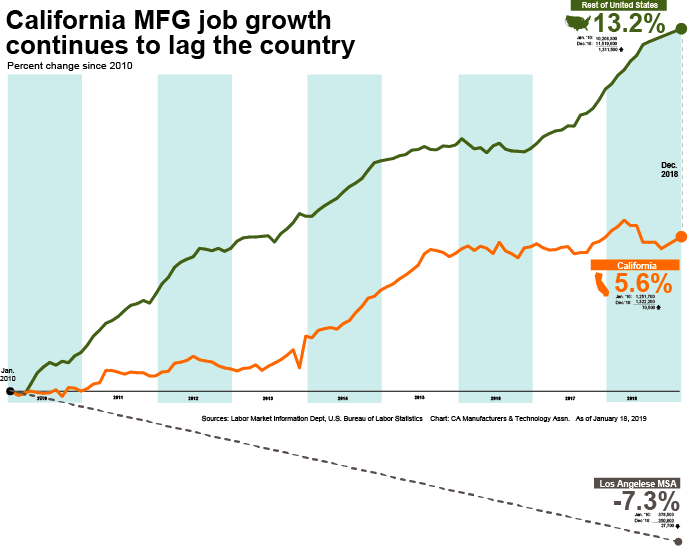 California must keep up the drumbeat of policies to atttract new manufacturing investment.